Earlier this month, my coworker Kim came back from a weekend in the Yarra Valley with a gift for me - a bottle of confiture de lait made with Guerande salted butter. Wow, how sweet! (Both literally and figuratively, hehe). I thought it was the perfect opportunity to do a little baking. 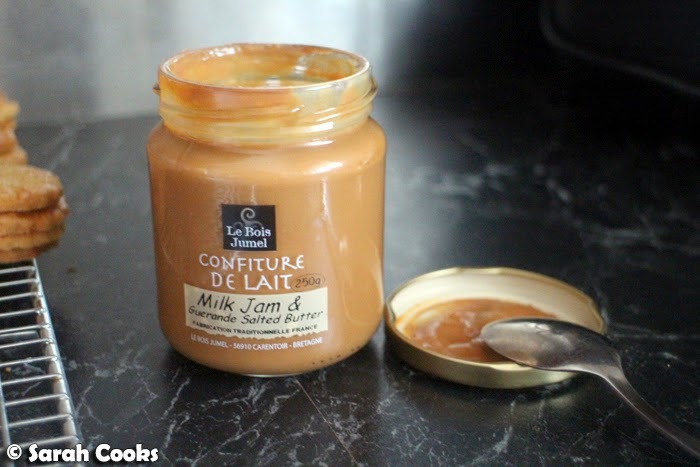 Confiture de lait (literally: "milk jam"), is kinda like dulce de leche - a thick, sweet caramel made from milk and sugar. 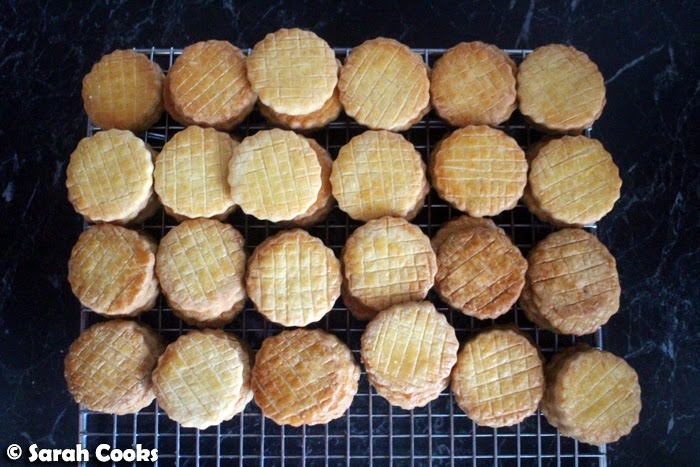 I thought that little sablés (French shortbreads) might go well, and found this fab recipe on Joy of Baking, which turned out really well. The only change I made was to replace the suggested unsalted butter with salted. It was cultured salted butter from Myrtleford, which another coworker, Deano, had gifted me the week before. I just realised that I've been gifted gourmet salted butter products by two separate coworkers in the last month. I am clearly winning at life! The confiture de lait was quite runny, which I thought would make it difficult to transport little biscuit sandwiches. 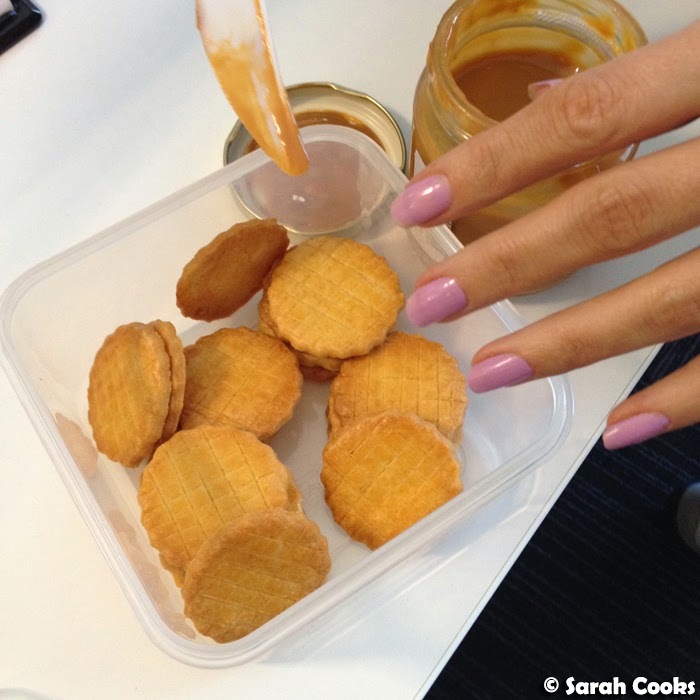 So rather than sandwich up all the sablés at home, I brought them to work with the jar of confiture de lait on the side, and asked people to sandwich them up themselves. My team went through most of that jar of caramel in one day! Woah! 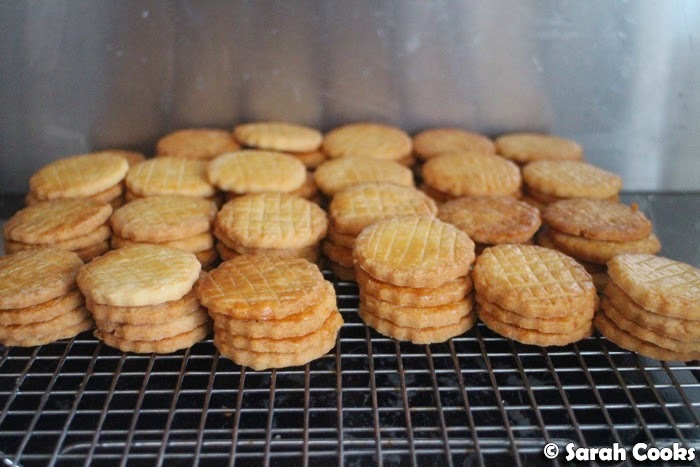 The sablés themselves are fantastique - crisp, short, delicate, and very buttery. These aren't like the thick Walkers shortbread fingers you can get at the supermarket, fabulous though those are, rather, these are delicate little morsels. 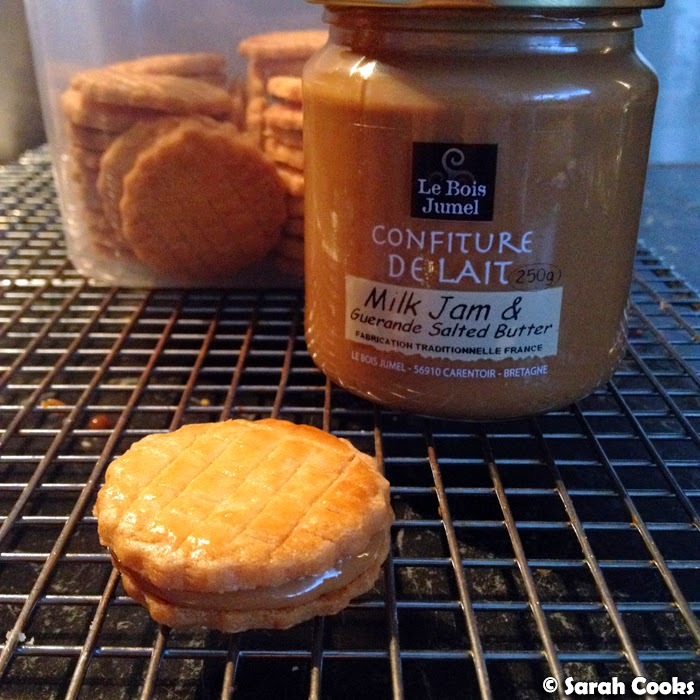 With or without confiture de lait, you are in for a treat! Beat the butter and sugar together, either by hand or in an electric mixer, until thoroughly combined, paler in colour, and soft and fluffy. Add the egg and vanilla extract and beat until combined. Sift the flour, baking powder and salt, then stir the dry ingredients into the butter mixture until just combined. Knead the dough to bring it together, then wrap in clingfilm and refrigerate for at least an hour or overnight. When you are ready to bake, preheat the oven to 175C, and line two baking trays with baking paper. Roll out the dough on a lightly floured work surface to 5 millimetres thick. Using a floured 5 centimetre cookie cutter, cut rounds out of the dough and arrange on the prepared baking trays. Gather together any scraps, re-roll and re-cut until all the dough is used. (You may need to do this in batches depending on the size of your trays). Beat together the egg and water for the glaze, and brush the biscuits with the glaze. 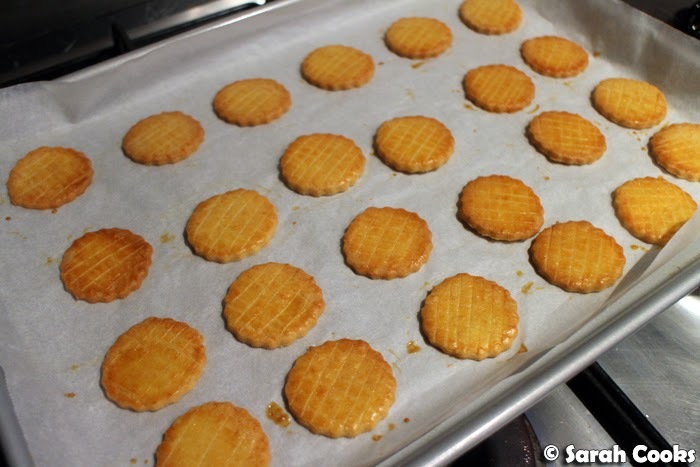 Using a sharp knife, make a criss-cross pattern on the top of each biscuit. Bake for 8-10 minutes, or until lightly golden brown. 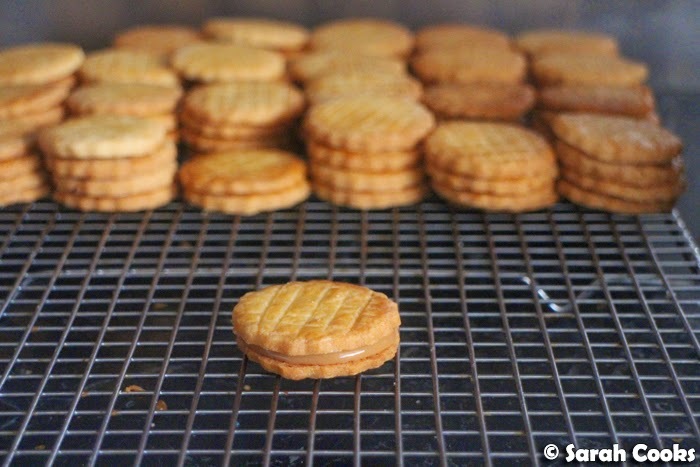 Allow to cool on the tray for a few minutes before transferring to a wire rack to cool completely. Either eat plain, or sandwich them together with confiture de lait or a spread of your choice. these look delicious sarah! i definitely will be making these sables.. love anything french! I have no words for how impressed I am that you actually baked with this. I'd've finished it in two days with a spoon, alone in my room. How gorgeous, but I probably shouldn't even ask how long doing the pattern took you!